The Houston Texans thought they would be preparing for a deep run in the playoffs. Instead as the new year approaches, they’re looking for a new coach and have the No. 1 pick in the draft after a stunning collapse cost coach Gary Kubiak his job and left them with the NFL’s worst record. He walked into his last news conference Monday with a plaintive plea of: "Let’s wrap up the season — please." Phillips is one of three candidates, along with Penn State’s Bill O’Brien and former Chicago Bears coach Lovie Smith, who have reportedly interviewed to be Houston’s next coach. Phillips, last a head coach in Dallas, said he would like to be a head coach again. "In certain circumstances, like here," he said. "Tampa Bay wanted to talk to me two years ago and I declined that. It would have to be the right situation. There aren’t many right situations." Houston safety Danieal Manning, who played for Smith in Chicago, said he’s talked to him about his interest in returning to coaching, but not specifically about this job. "I’d love to play for Lovie again," Manning said. It was quickly apparent the record-setting University of Houston quarterback wasn’t the answer as the losses piled up. 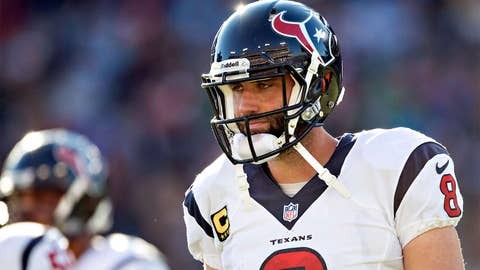 Schaub got spot work in two games after his benching before starting the final two games after Keenum was injured. It seemed fitting in this dreadful season that he threw an interception on Houston’s last offensive play Sunday to seal the loss. The quarterback woes have many predicting Houston will use the top pick on a QB. Top quarterbacks likely to be available are Louisville’s Teddy Bridgewater, 2012 Heisman Trophy winner Johnny Manziel of Texas A&M, and Fresno State’s Derek Carr, younger brother of Houston’s first-ever draft pick, David Carr. But Schaub’s rough season was far from Houston’s only problem this year. It dealt with several season-ending injuries to key players. Running back Arian Foster played eight games before being placed on injured reserve and undergoing back surgery. He finished with 542 yards rushing to end a streak of three straight seasons with at least 1,200 yards on the ground. Backup Ben Tate broke four ribs just before Foster’s season ended, but continued to play until another injury to his ribs sidelined him with two games left. "The team didn’t do well, but they did well and did some amazing things," Phillips said.